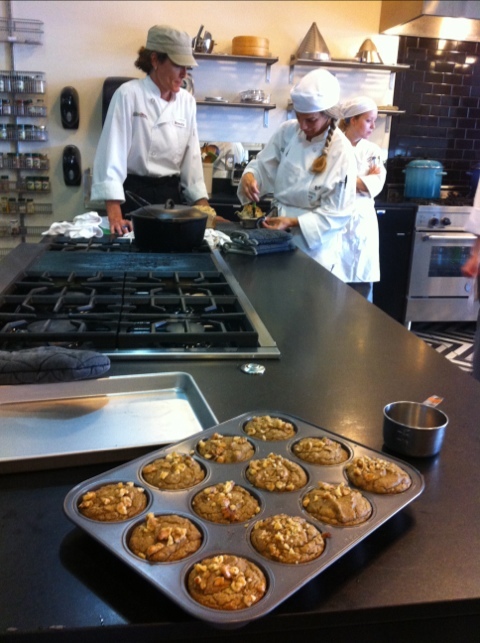 Maybe it’s all the dehydrating going on with the Natural Epicurean students. 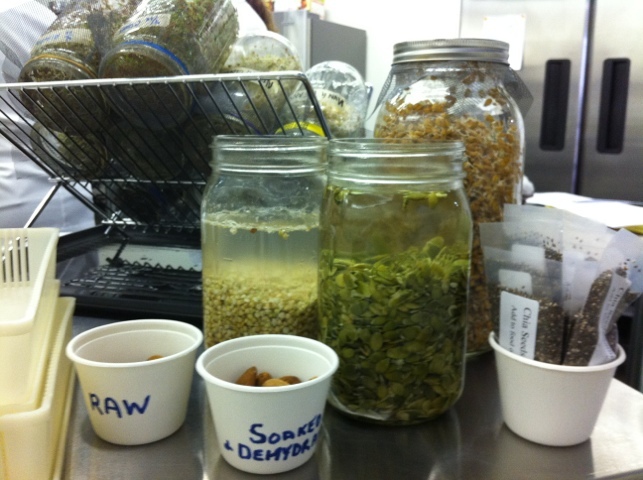 All kidding aside, we spent some time this week learning dehydrating methods. 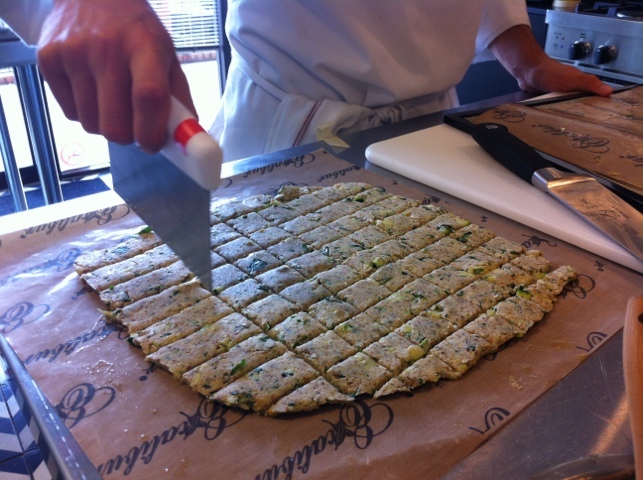 Dehydrators are used extensively in raw food cooking to help create a cooked-like texture in foods. You can make beet chips, kale chips, crunchy croutons, crackers, and other crispy items. In raw food, you don’t heat the foot over 118 degrees, but if you gently heat certain foods and apply a gentle air flow, the food with dry out and develop new textures. The mouth needs a variety of textures to feel satisfied, and it’s true for raw foodists as well. Dehydrating food is not an instant gratification meal preparation method – the process routinely takes 8 – 24 hours or more. With planning, it can be successful, however. 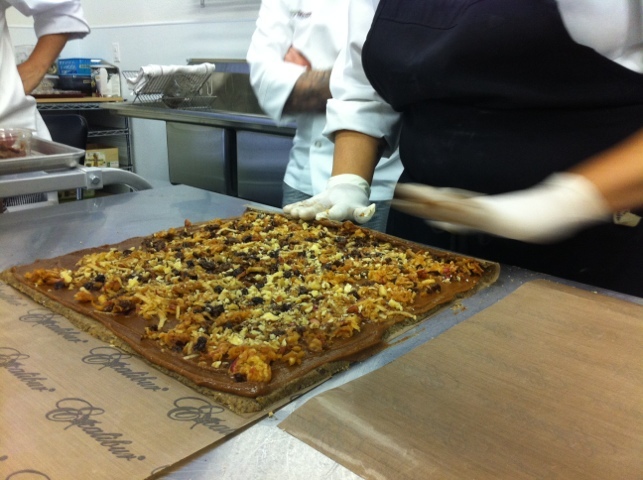 Below: Chef Alicia shows the class how to smooth a dough out for making dehydrated crackers. 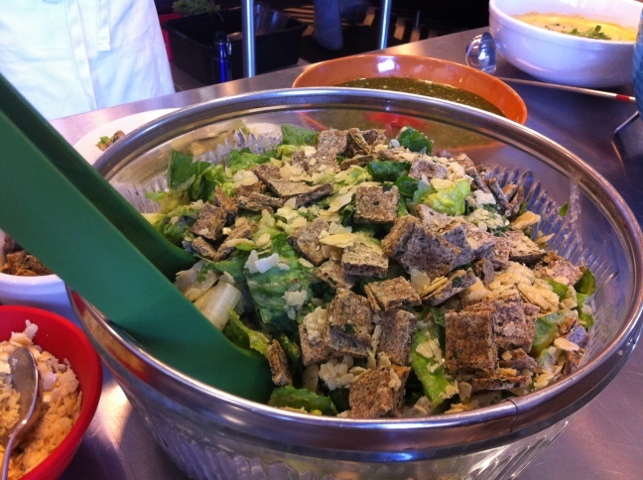 Below: Scoring a crouton spread made from almond meal and herbs. These croutons taste amazing. They are being dried on paraflex paper, which is a non-stick material. 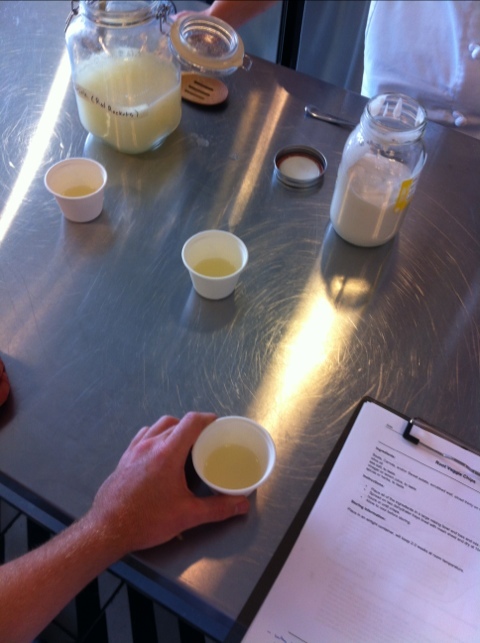 Below: Sampling coconut kefir drink and coconut yogurt. 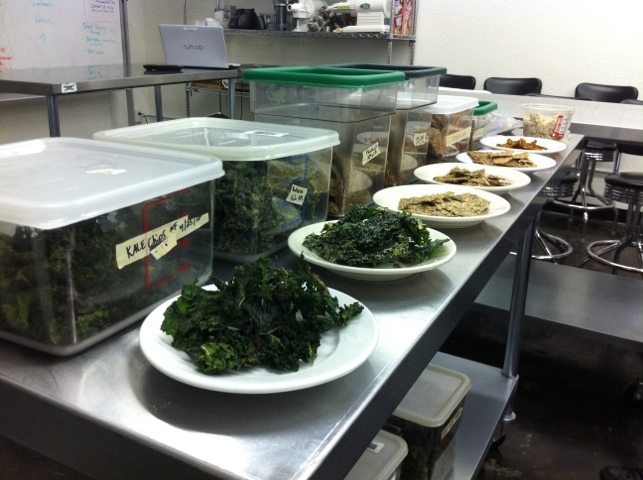 Below: A sampling of kale chips, crackers, and breads that we had started dehydrating earlier in the week. 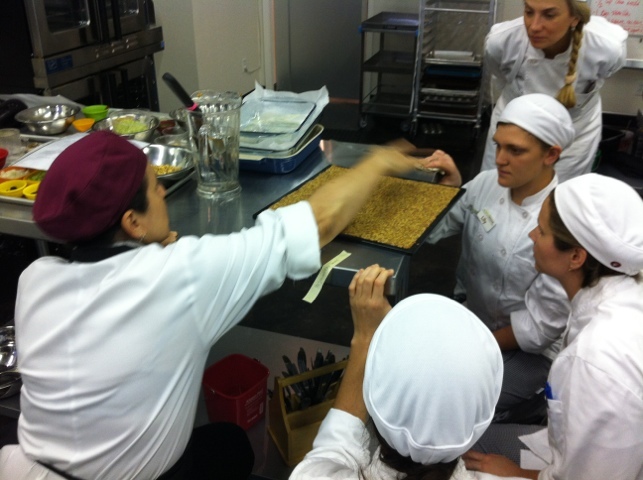 Below: Chef Alicia demonstrates rolling a raw cinnamon roll. Yeah! 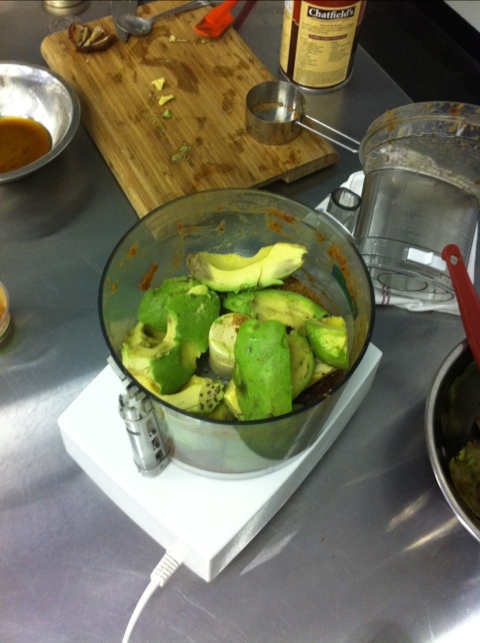 We continued our foray into raw food by making some raw sauces and dips. It’s common for people to look for creamy and/or cheesy dips and spreads when they are at a social function – the fats and umami flavors of cheese garner a lot of desire, it seems. The dips and spreads we made were designed to mimic those flavors, as well as other familiar dishes such as cheese spread, hummus, and ketchup. 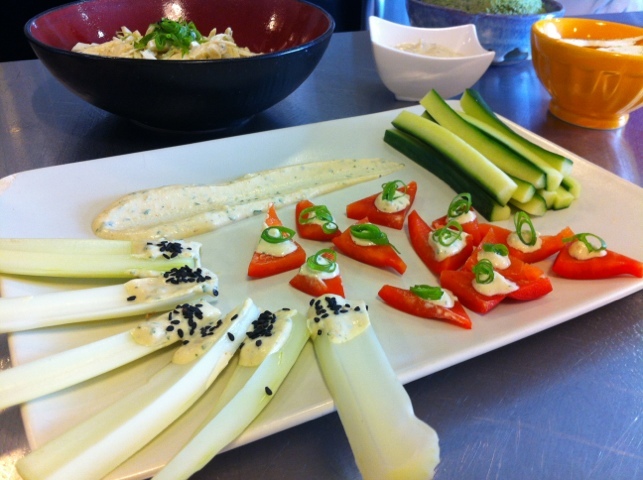 Below: Spiced cheese spread on crudites. The cheese flavor was very good on this dish. 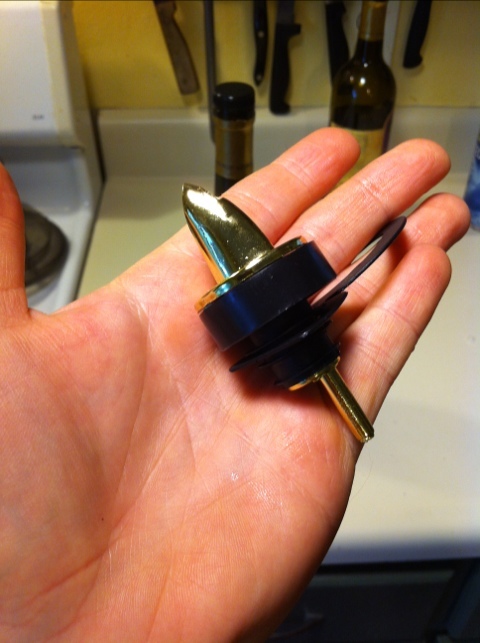 Then don’t use an unsealed spout like the one pictured below on your oil and don’t store the oil near your stove top. After just a couple of weeks, a fresh bottle of oil has gone rancid from constant exposure to the air and possibly the warmth of the stove, developing a bitter taste that makes it completely unusable for salad dressing or any fresh application. My typical olive oil brand, Napa Valley Naturals, has been including these plastic spouts for free on their olive oil bottles, but I think they’re doing their customers a disservice. I suspect that the spout was more of a factor in the rancidity problem than the stove, but only science could be sure. Experiment time? 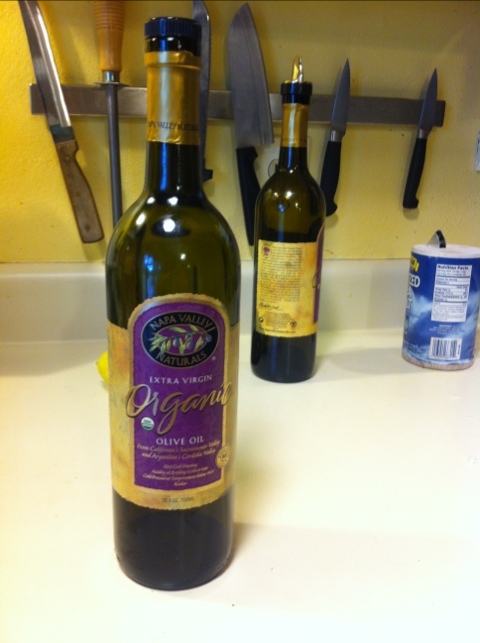 Below: A fresh bottle of olive oil with a nasty one in the background. 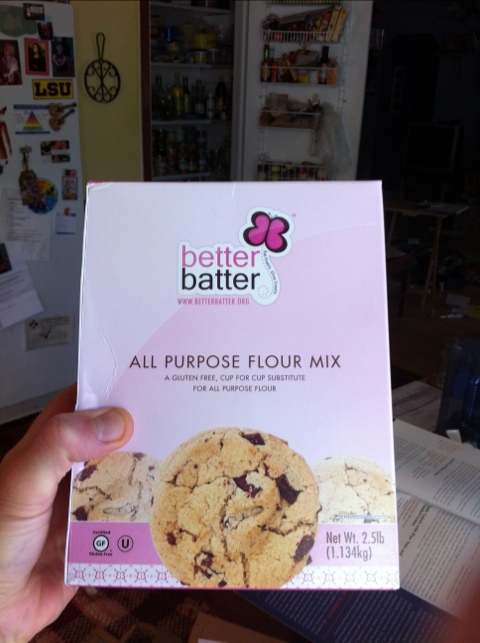 Jean cooked some biscuits for us in a gluten-free lab one day and I was seriously impressed. It had been quite a while since I had experienced biscuits and these were no mealy, gritty, phony biscuits either – they were flaky and delicious. 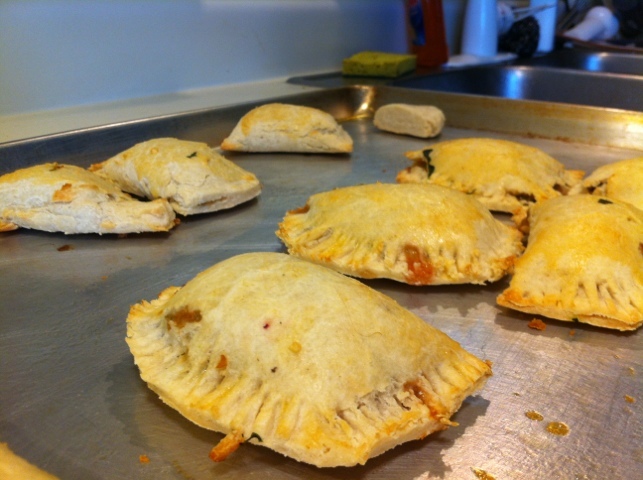 I had empanadas on the brain – I used to love empanadas from my days in Orlando. Casa de las Empanadas, if you still exist on Oak Ridge Blvd, I am thinking about you. Bahama Breeze and I are homies that go way back, as well. Ah. I spent quite a bit of time this week thinking about my mid-term menu on May 4th. We have to prepare a four-course meal for our instructors to critique and I’ve been finalizing the details. I decided to do a quiche as part of my entree since I love quiche and I think it looks great. 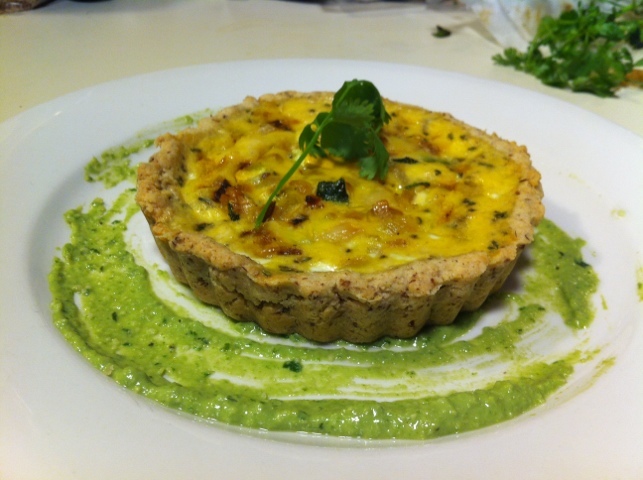 Below: A sample roasted vegetable quiche with basil-cashew cream sauce. 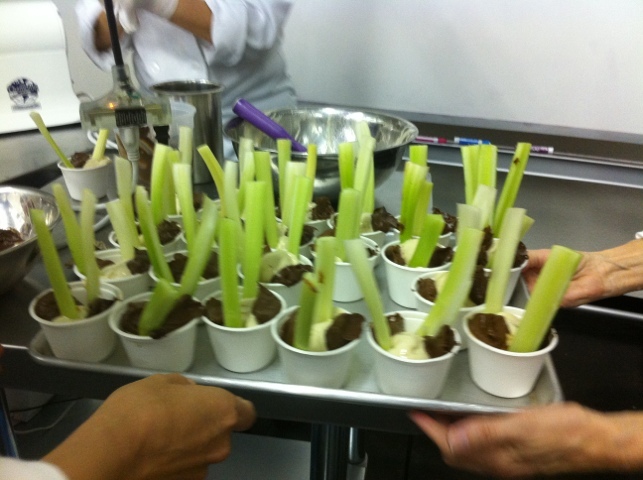 We kept rolling through our raw food classes with Chef Alicia. She showed us several raw preparations. One of the tasty treats we learned about was chia seed cereal. Chia seeds are pretty hot these days – they are high in omega-3 fats, antioxidants, and minerals. They are a bit pricey at about $9 per pound, but as I have said before you must prioritize your health. 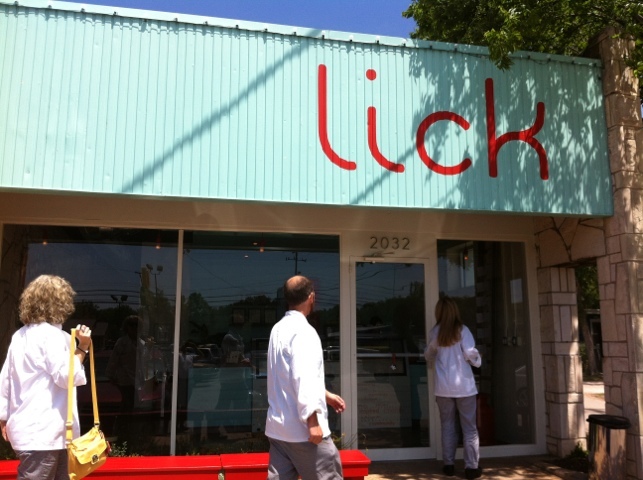 Lick is one of the great little spots in Austin that is representative of the city’s ethic of unique flavors, local ingredients, and independent ownership. 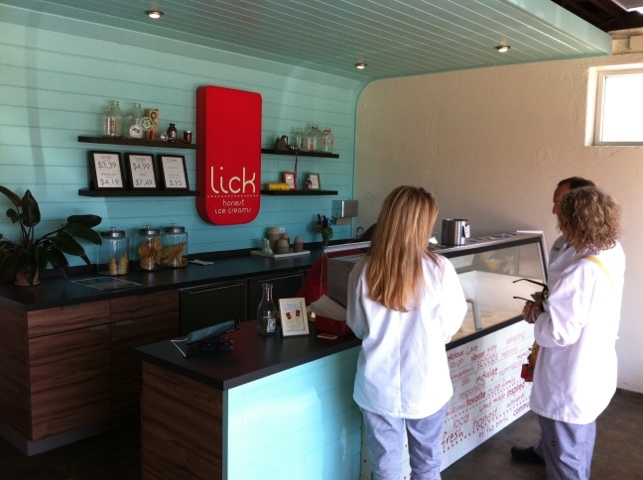 Lick is a new ice cream shop with some truly great tastes, including some vegan selections. On Friday, Chef Alicia had several jars of sprouts ready for us to taste and she assigned us the job of growing some sprouts of our very own. Sprouts are eaten raw and they are a truly living food. 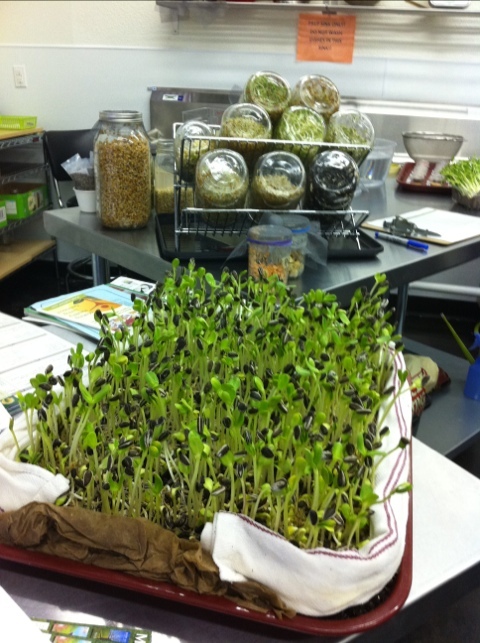 Sprouts are not only alive, but they are VERY alive and growing. They are nutrient dense and full of chlorophyll, which is only one molecule different from human blood. Sprouts are emergent plants, so they have to be full of nutrients to survive and rapidly grow, which means by eating them you get to enjoy the health benefits of those nutrients. Below: A class assistant is preparing a raw version of parmesan cheese made from pine nuts, lemon juice, and nutritional yeast. I tasted some and it was amazingly similar to the genuine article. 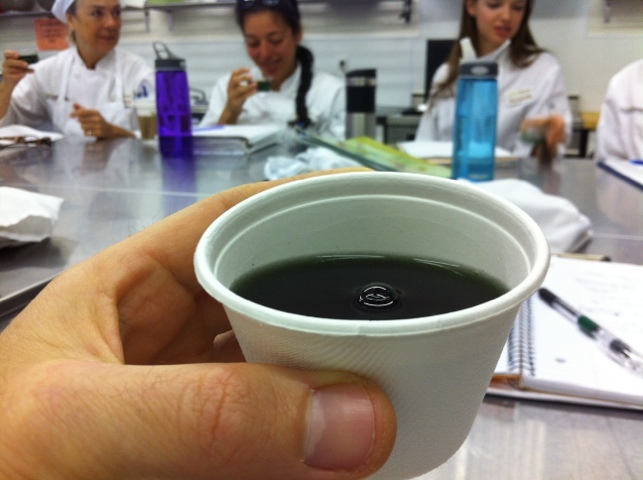 Below: A peppermint, chlorella, spirulina drink that Chef Alicia shared with us. After drinking, I lifted a car above my head. 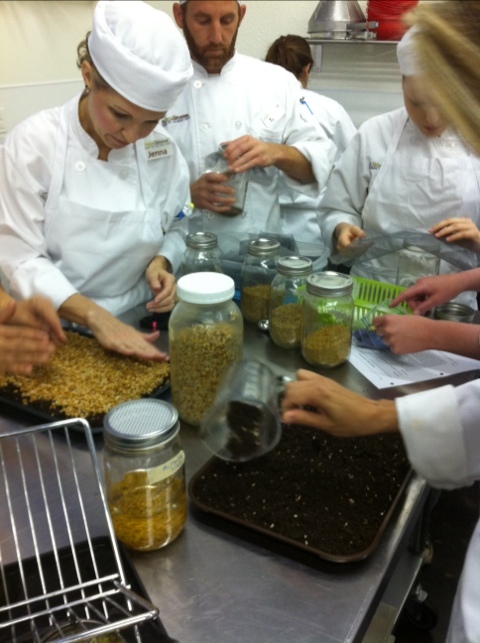 Below: Chef Alicia explaining the process of sprouting and assigning us our very own seeds and beans to sprout. 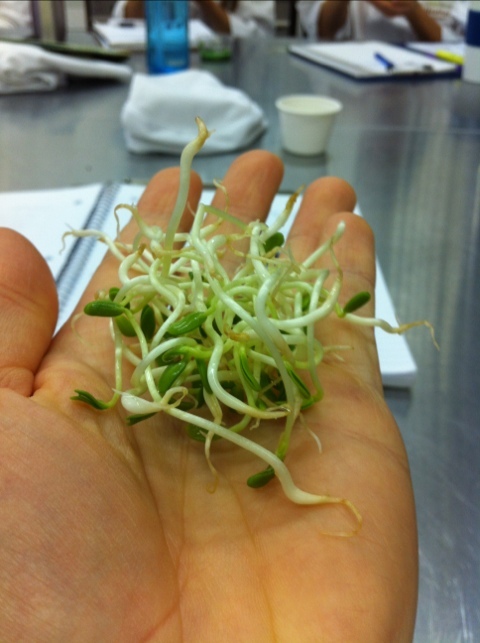 Below: Some fenugreek sprouts we sampled. Below: Planting wheatgrass sprouts into fresh organic soil. 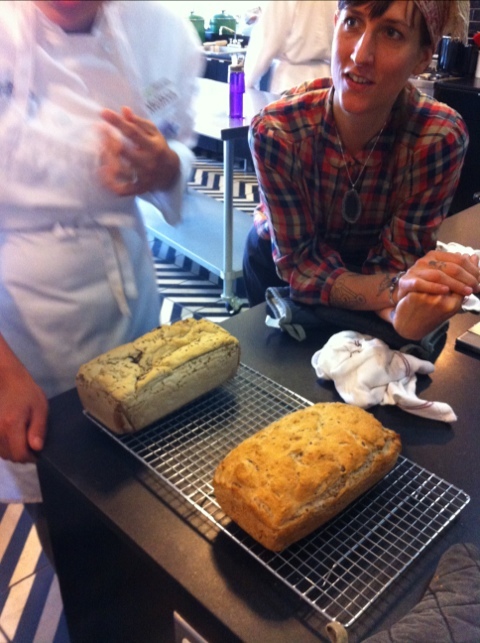 Below: Lou (right) talks over the intricacies of gluten-free baking over a couple of fresh baked loaves. Below: Some gluten free muffins cooling below. Below: Our gluten free bread cooling and ready for final tasting. My favorite was the pine nut-fennel version at left. Using a smaller bread loaf pan seems to help prevent the bread from deflating, like the ones second and third from left. Week 10 began on Monday. We’re just about at the halfway point of coursework. Sigh. So much done and so much left to do in class. And so much to do to prepare for my life after school. 🙂 In three months, I will be done with classroom time and will need to get out there and work! This week we are continuing our exploration of all that is raw food and Monday started with juice, smoothies, and milks. We made vegetable juices, nut milks, and smooth drinks. We used coconut milk, cacao, almonds, kale and other greens, ginger, and lots of other great ingredients. I was surprised how much I liked the vegetable juices, including one with ginger that was delicious. I also tried wheat grass for the first time – it was actually kind of sweet! Wheat grass is supposed to be a great juice for detoxifying the body. I’m not sure, but I felt pretty good after the morning session. We used a Champion juicer and a Green Star double-auger juicer, as well as a couple of Vita Mixes to make the drinks in class. 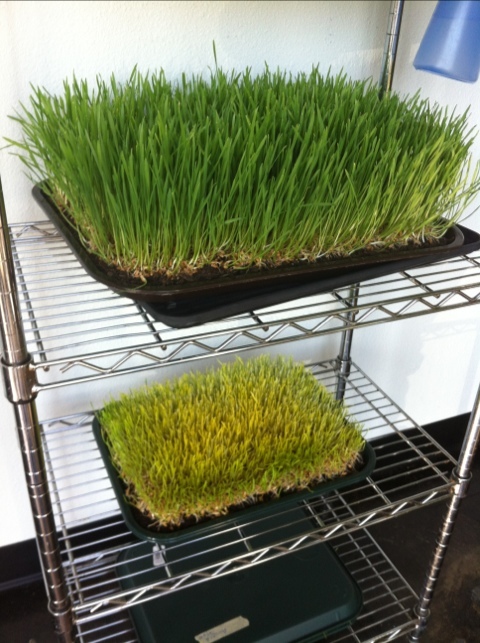 Below: Wheat grass growing in class. The patch on the bottom was planted by my classmates and I on Friday during class. 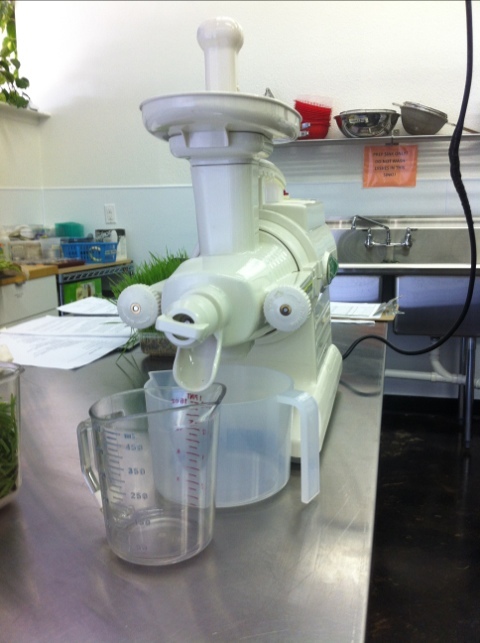 Below: A Green Star double auger juicer recently given to the school – one of the better juicers available. 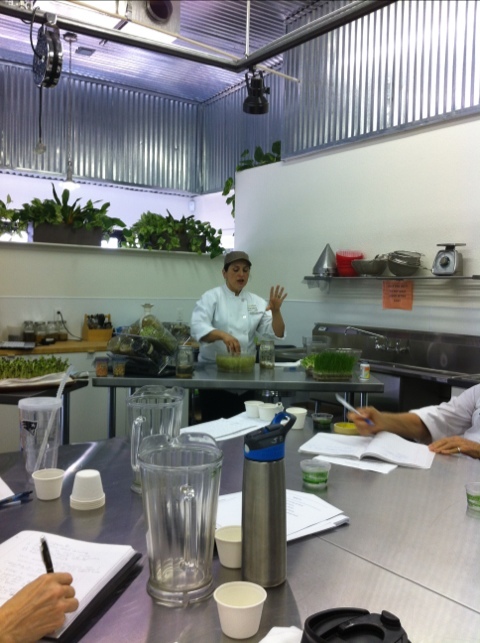 Below: Chef Alicia juices some wheat grass for the Natural Epicurean students. 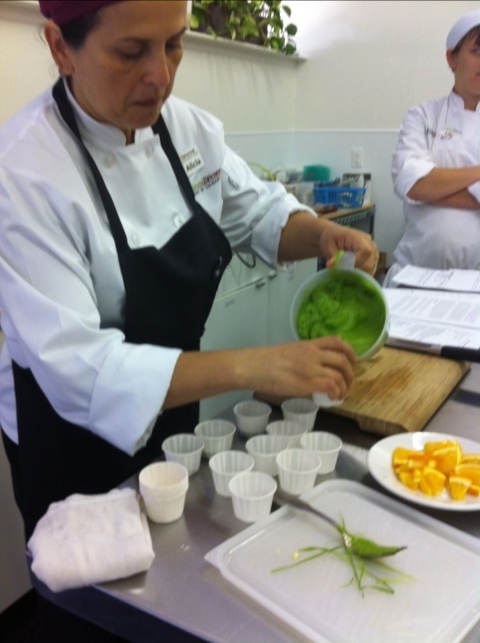 Below: Chef Alicia pours each of us a shot of fresh wheat grass. 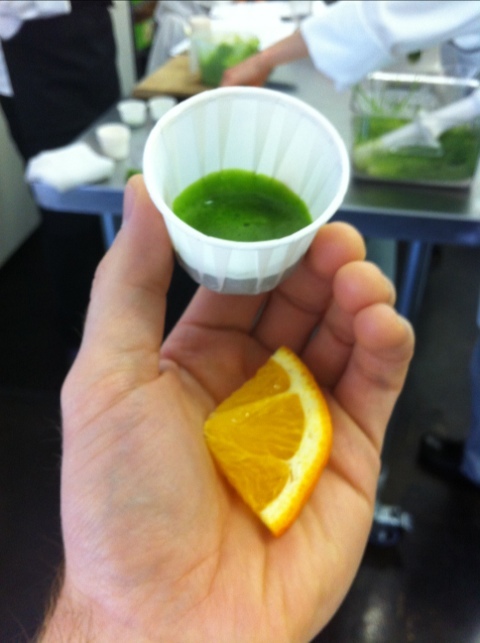 Below: Wheat grass shot with an orange wedge chaser. The chaser really wasn’t necessary, I think because the juice was so fresh that the bitterness was not very prominent. 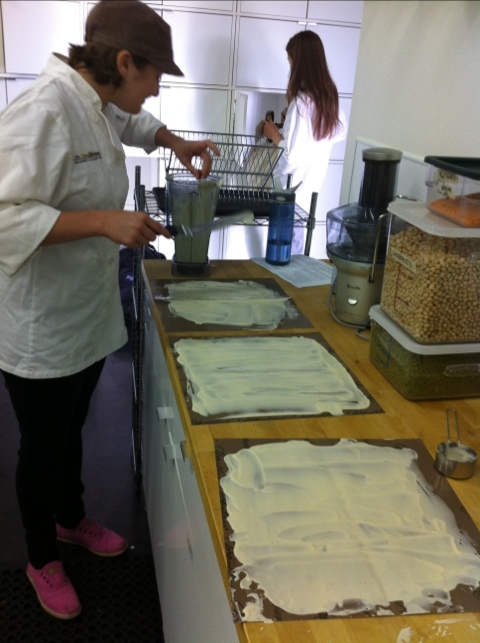 Below: Chef Alicia squeezes some almond milk after blending almonds in a Vita Mix. 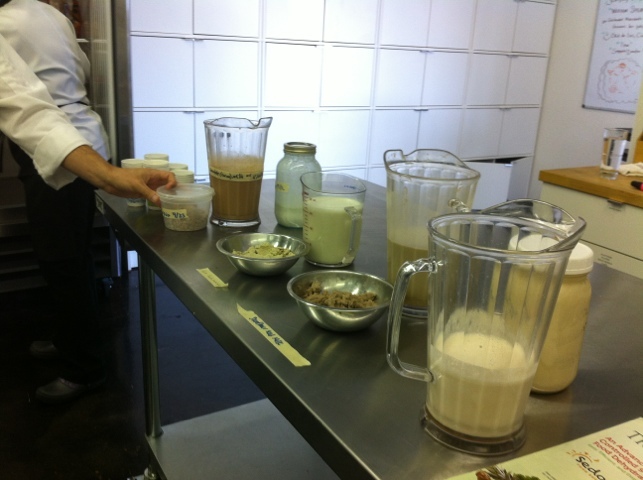 Below: We made several nut and seed milks: Almond, sunflower, pumpkin seed, and hemp. All had very different flavors. Below: Chef Alicia shows us how to open a fresh coconut. I opened one myself later on in class. 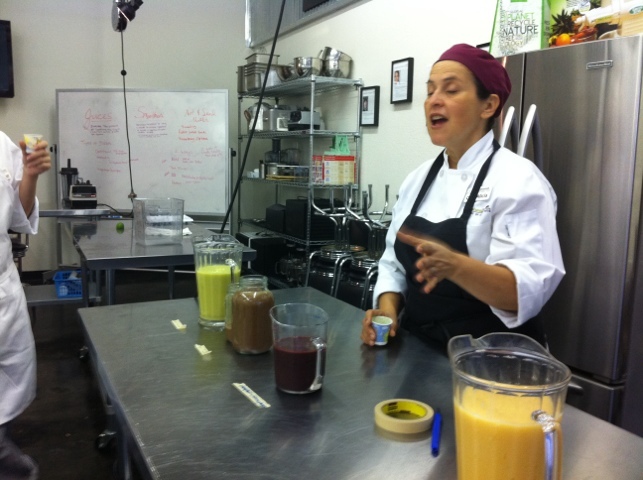 Below: Chef Alicia talks about making juices like the ones below. 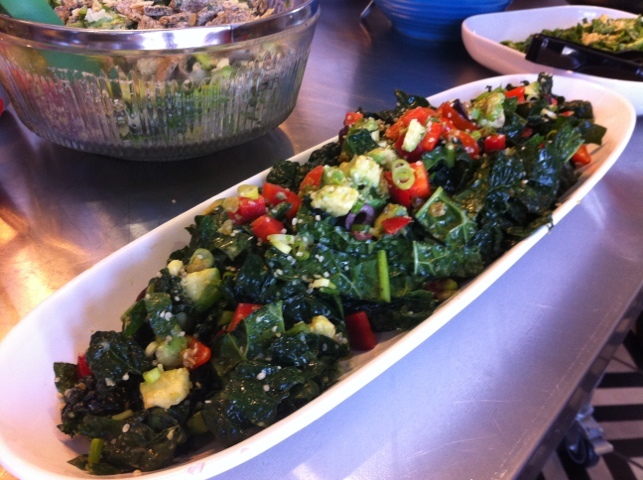 We rolled right into the afternoon to make some salads and soups with Chef Shahnaz. 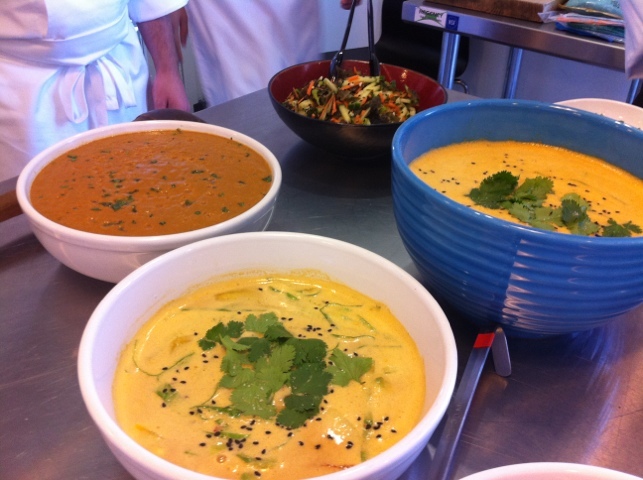 On the recipe list were gazpacho, carrot soup, kale salad, caesar salad, Thai coconut soup, and several others. Below: A delicious Mediterranean kale salad. 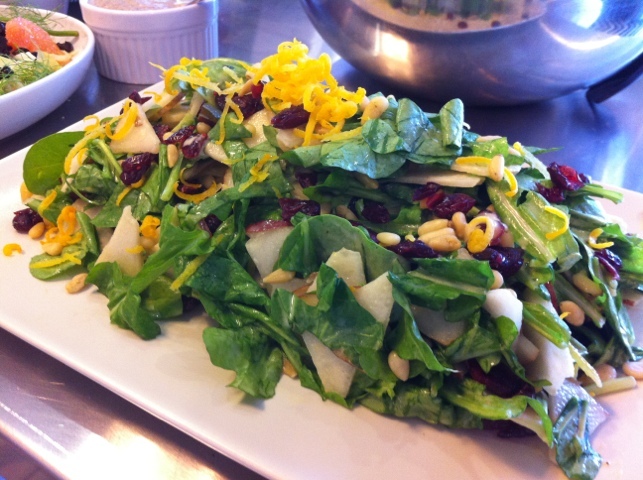 Below: Pear arugula salad with Meyer lemon. Below: A raw vegan tortilla soup (left), a sea vegetable salad (top), and two bowls of Thai coconut soup (bottom and right). My buddy Todd and I got together for yet another Thursday cook jam. This time, we were focused on the upcoming mid term at The Natural Epicurean. We each had concepts to test before we finalize our menus. 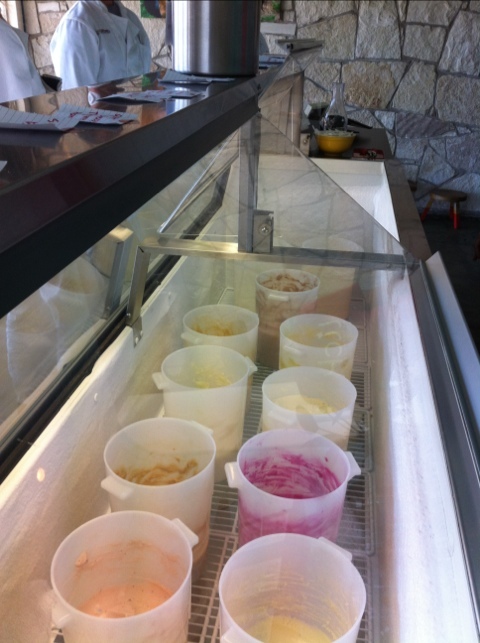 Sadly, my main goal – a successful sorbet – was not met, perhaps because of a poorly-prepared ice cream making machine. I’ll need to try it again this weekend. 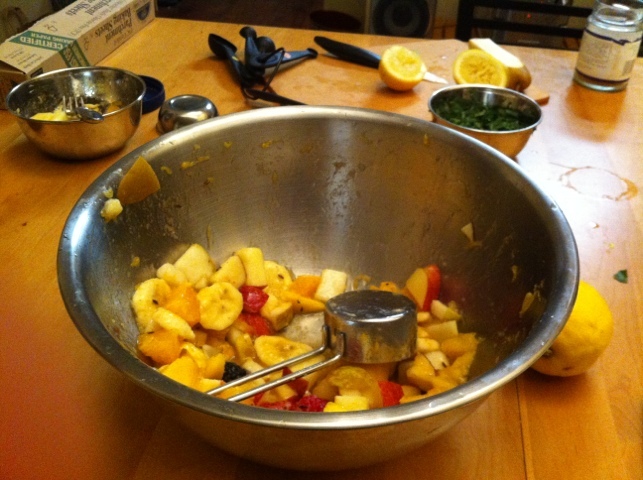 Below: Todd tested an Indian fruit salad with some atypical seasonings – black salt, cumin, asafoetida, etc. It was suprisingly excellent. 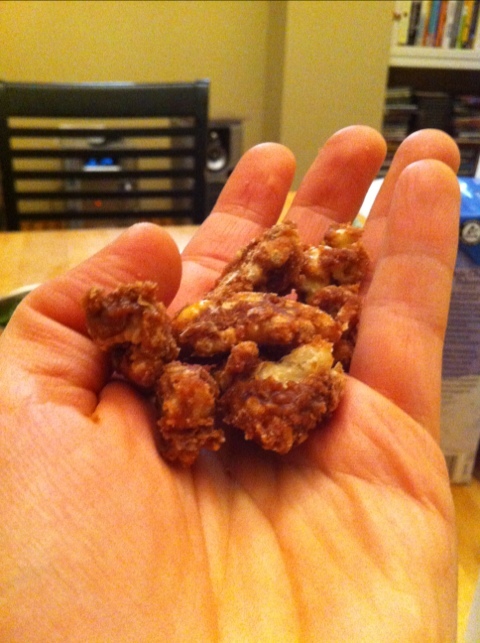 Below: My success of the night – candied walnuts for a possible salad or sorbet topping. A simple technique, but one I had never done before. Highly addictive. 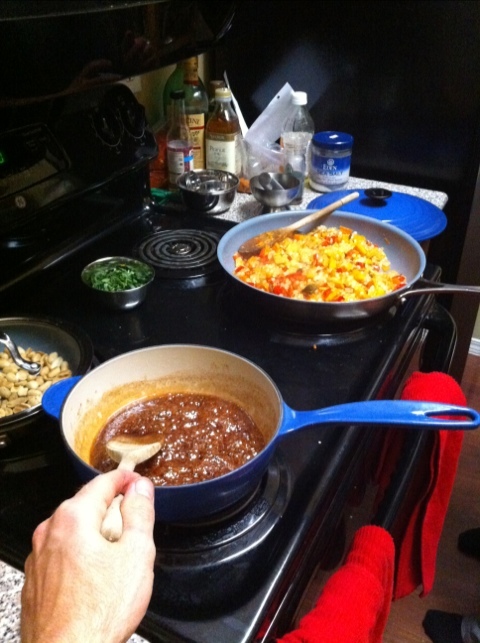 Below: The syrup for the walnuts (bottom) and a tapioca stir fry (top). So, there is going to be a mid-term “exam” in two weeks. 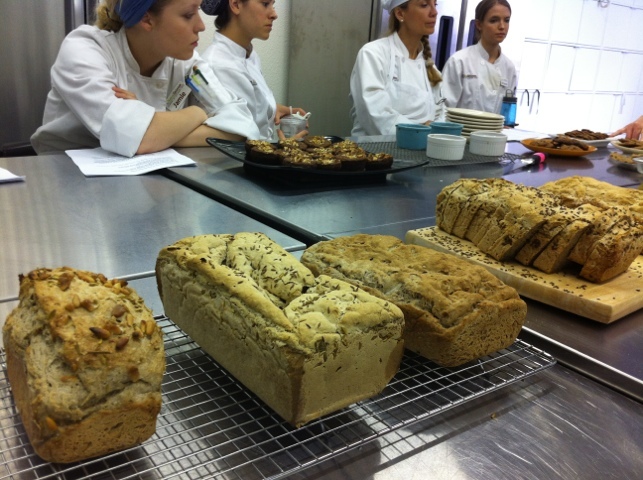 What does a mid-term look like in culinary school? Well, we have to develop a four-course menu using seasonal ingredients, include some enticing descriptions and basic nutritional information, and then a couple of days later (May 2 and 3) we cook the menu by ourselves for our instructors to critique. Sounds fun, right?! 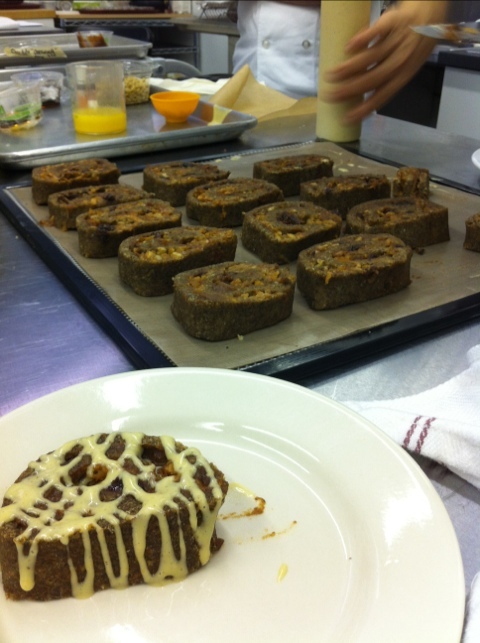 Chef Alicia pulled out the big guns on Wednesday to show us how awesome raw food can be. 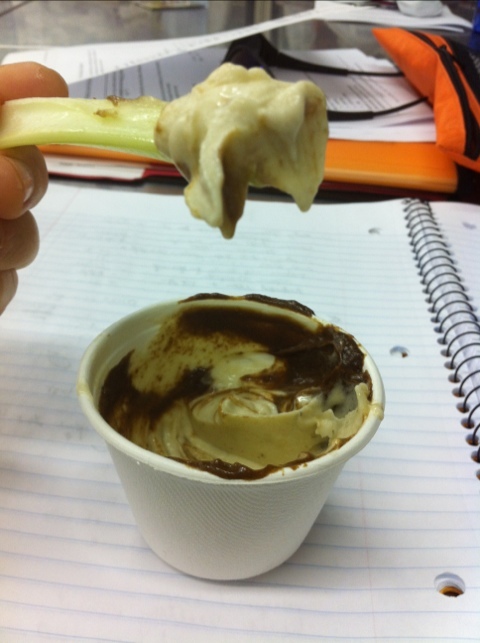 Some frozen bananas + a little raw chocolate mousse + a couple of kitchen gadgets = awesome raw ice “cream.” Sooo good! 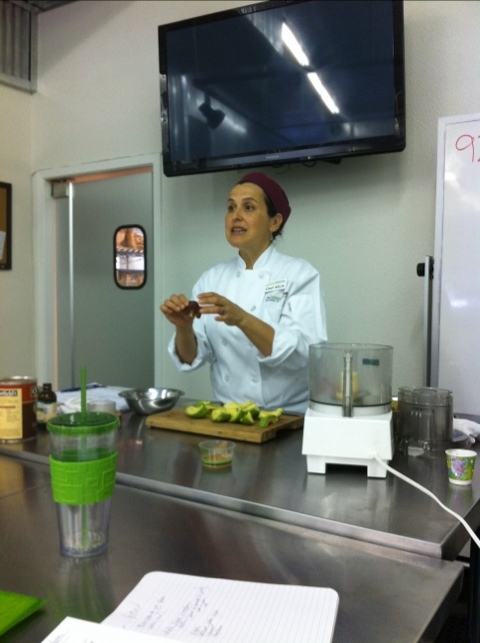 Below: Chef Alicia talking about how avocados will lend creaminess to the chocolate mousse. She made a cacao version and a carob version – both excellent. 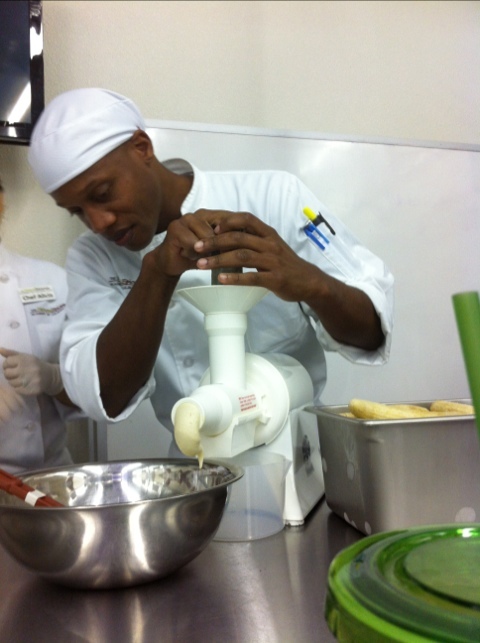 Below: Using an auger-style juicer to extrude some frozen bananas. Basically it mashed them into a creamy paste which is exactly like ice cream in texture. In our introductory lectures, the instructors typically expose us to typical and unique ingredients that we will come across. 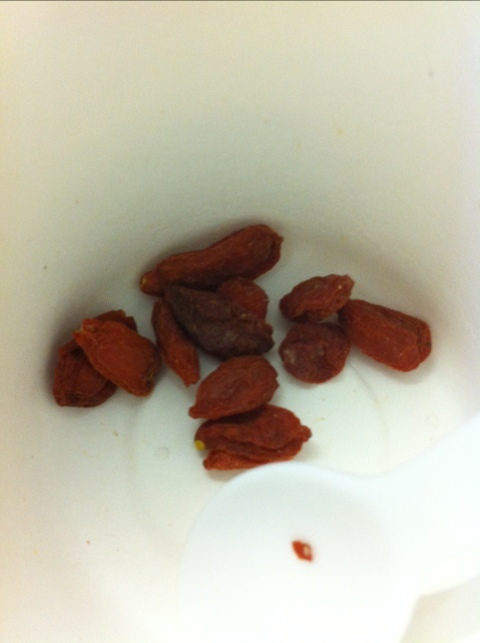 Chef Alicia shared with us some cacao beans and goji berries, both rich in antioxidants. 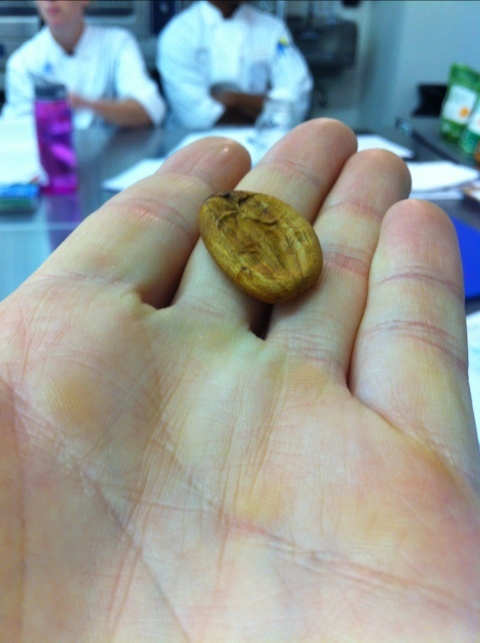 The cacao bean was very chocolaty, but also fairly bitter. I liked knowing that it was an unadulterated plant product and so in a way I liked it better than typical dark chocolate. 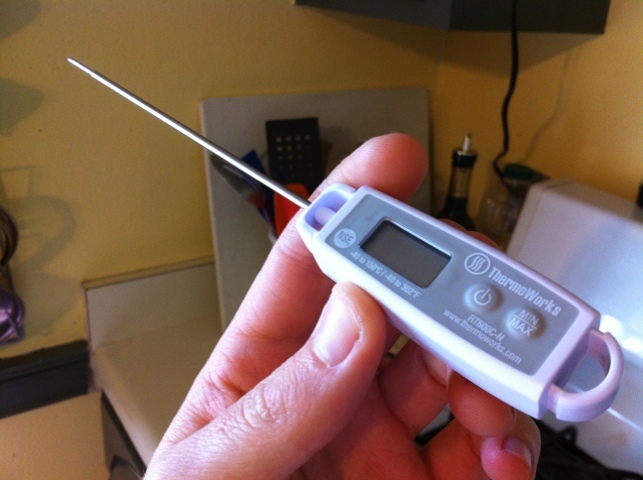 I got a new thermometer to replace my analog dial-faced one. The digital is much faster and has a larger range. Sadly, it’s about three feet long and looks weird in my chef coat pocket. Still trying to figure out how to stash it on my person during class.